Here are the winners of the second edition of the Glider prizes! The first lucky one with a prize of 1000€ and chosen unanimously by his colleagues is Ernesto Jiménez, who was also honoured in the first edition. I’ve found it very hard to write this part, since it’s complicated to list his achievements given that he touches everything. He has been responsible for much of the ‘cleaning’ that is being done inside Tractis, principally adding helpers to unify the user interface and simplify tasks for the designers. However, lately his work has shifted to the resdesign of the Tractis architecture. His colleagues have also emphasised his proactivity when the brown stuff hits the fan! If you need a programmer awake at 5 in the morning, he’s your man. In fact, right now, while I’m writing this post, he’s pestering me on GTalk. The second prize, also worth 1000€, goes to David Calavera. In the first edition, David was on the point of winning a prize despite his late incorporation into the project. This time, he’s demonstrated his worth especially in one of the most unappealing but critical parts of the project – the digital signature Applet. (Who wants to program in Java when you can do it in Ruby?). For visiting the gloomy part without passing to the dark side, this prize is for him. Finally, and for the first time, we’ve decided to divide the prize chosen by the employees into two prizes of 500€. The lucky ones are José Gordo, who also won in the first edition and Juanjo Bazán. José Gordo keeps doing an exceptional job keeping our production and development environments up to date as well as investigating alternatives for deploying the application in distributed environments. For his part, Juanjo has developed loads of functionality in Tractis such as the user preferences and a lot more code that, whilst not yet ready for production, will be fundamental to the business. While he has not received a prize, since he joined the project half way through development of the second release, Luis Miguel Cavallé deserves a special mention. He worked very hard to ensure the application was ready for release and, since the day he joined the project, has been one of the most active collaborators. At Negonation, every time we complete a milestone we want to reward the efforts of our collaborators. The first edition was very hard-fought and this one promises to be even more so. Unfortunately we can only give 3 prizes. If we gave one to everyone who deserves it, we’d have a big overdraft! The deadline for receipt of votes from collaborators is Sunday 17th December at 23:59 UTC. As mentioned in recent entries in this blog, we’ve spent the last few weeks concentrating on development of the new version of Tractis. It’s taken longer than we initially thought but we wanted to make sure every detail was right. The latest Tractis has a much more finished feel than the previous version. Even we’re surprised at how much we’ve changed in such little time. It’s unrecognisable! Internationalisation: Tractis is now available in English and Spanish. Over time we hope to support more languages. Improved User Interface interaction: modal windows, alerts, progress indicators. Overall a much more consistent experience. Now it’s over to you, the beta testers, to tell us how we can improve. To facilitate this, we have added a link to the application that allows you to inform us of errors or suggest improvements immediately. Over the next few days, we plan to send over one thousand invitations to view the beta version. You might receive the next one! There’s a cliché which says that only bad systems administrators are known while good ones are invisible for the rest of the team. No-one remembers sysadmins when everything is running smoothly, the only thing you’re concerned with is the person in charge of maintaining servers up-to-date when everything fails. Aware that within a development team there are “invisible men” for the rest of the team, we decided to reserve one of the Glider Awards for Negonation employees in order to compensate them if this were necessary. Interestingly enough, it was not necessary to resort to that option since the collaborators themselves recognized the work of our sysadmin: José Gordo. I am proud to say that it is a pleasure to work with the best sysadmin that I have ever known. I could use all this post to talk about his tasks: server contracts, DNS administration, SSL certificates, software installation, backups, capistrano deployment scripts, security updates, and monitoring of the development and production environments, all of which he does skillfully. But if I had to highlight a single piece of work it would be the fine-tuning of the production server. We had decided to hire a dedicated server with a pre-installed CentOS and we decided to migrate it to the Ubuntu Server. Since we did not have physical access to the server, an operator was needed to intervene. The cost was prohibitive and it did not ensure the desired results, so we decided to transplant the operating system. Basically, José did an open-heart transformation of CentOS into a Ubuntu Server and added RAID support, taking advantage of the server’s two discs. To appreciate the complicated operation, you should take into account the fact that the network environment has to be operational throughout the process: a single fault and we would not be able to enter the machine. Instead of simply crossing his fingers, he installed a replica of the environment of a virtual machine in a computer to which he had physical access and repeated the operation several times until making sure that the technique worked. Finally, the same procedure was made in the production environment in a completely satisfactory way. Another winner was Juanse Pérez, one of the project’s oldest collaborators. His task in the last few months has also been one of the most invisible for the rest of the team. He has focused on two issues: document comparison, and the creation of Tractis’s entire internationalization infrastructure. Although there are still some details to complete in the latter, the work has been excellent. We are now able to generate gettext’s .PO and .MO files and upload them to our translation application, pootle, with barely any effort. That task, which I first thought was very tedious, is solved with a few actions by the developer thanks to his work. This and his willingness to collaborate in any task at critical times have been a determining factor for the award. Lastly, though he has not received an award, a special mention goes to David Calavera, one of the latest to join the project. Despite the short period he has been with us, his work has been essential on both the client and server sides. His willingness and the speed with which he has adapted at a difficult time have been evaluated. Negonation is pleased to announce the creation of cash prizes to reward our collaborators’ efforts. What are the Glider Awards? They are awards that Negonation will give to its most valuable collaborators. The “most valuable collaborators” are those who, according to their peers, contribute most to meeting our milestone and sharing knowledge with their colleagues. On this occasion, three prizes of 1,000 euros each will be given. Two of the prizes (2 x 1,000 euros) will depend on the collaborators’ votes and the other one (1 x 1,000 euros) on the Negonation employees’ votes. Eric Raymond, proposed the use of this emblem to identify hackerdom. In Conway’s Game of Life, a glider is the minimum cell pattern with the ability to move. We believe that this perfectly describes what we are: small but agile. At Negonation, we are fanatics of emerging systems where everything is more than the sum of its parts or where, based on simple rules, complex behaviors are achieved. All the collaborators who have participated in any way in meeting the milestone. There isn’t a list. You know whether or not you can vote. Any collaborator, regardless of when they joined the project. Therefore, Negonation employees are excluded. How are the votes cast? If you are a collaborator, choose the two people you think most deserve this recognition and email me the names before Sunday 13 August. The decision is final and will be announced on this blog on Monday 14 August. I have been using Textmate as the only text editor for the last two weeks. I’d wanted to lay my hand on it for a long time since I saw the Ruby on Rails screencasts but, until I received my MacBook, I did not appreciate this editor’s marvelous features. 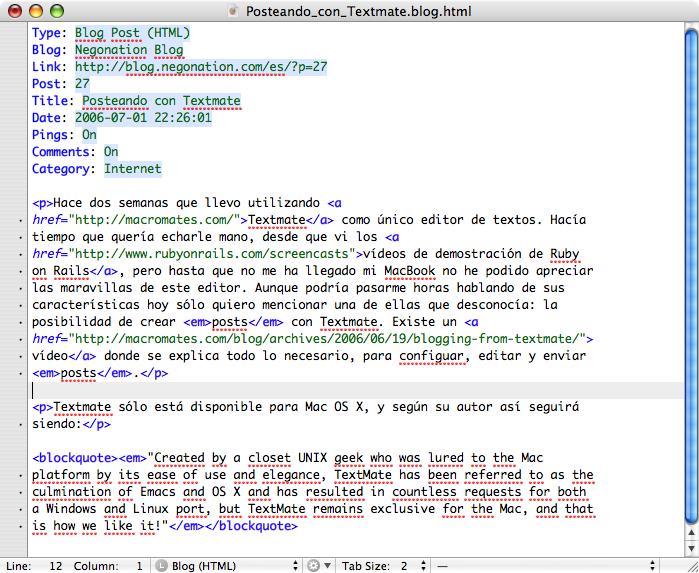 Although I could spend hours talking about its characteristics, today I will only mention one which I did not know: the possibility of creating posts with Textmate. There is a video that explains everything that is needed to configure, edit and send posts. Yesterday I had a conversation with a person with first-hand knowledge on the havoc caused by the Internet on some teenagers and their families. His thesis, in my opinion somewhat radical, is that a child or teenager should not have unsupervised Internet access until reaching maturity. This has made me question some of my own principles, which I believe were firm, on the free access to information. Below is the result of my reflections. I want to clarify that I am against information control. A mature person should be able to distinguish whether or not a piece of information is true and to ascertain the issuer’s intentions. This is why I don’t believe in censorship administered by a higher institution; what I do believe is that the adults themselves should be their own censor. However, children are naïve by nature, the stimuli they receive require supervision, and the parents’ duty is to know and even censor that stimuli if they do not consider them appropriate until the child has a mature personality. This does not mean that children should agree with their parents’ opinion; in fact, I believe that critical thought, even rebellion, is one of the first symptoms that they are reaching intellectual maturity. Use common sense, the Internet is not that different from the rest of the world. As in the real world, there are appropriate and inappropriate stimuli for children. Children alone in their room are exposed to all of them. If you don’t allow your children to talk to strangers in the real world, do the same in the Internet. If you don’t have qualms about searching through their personal belongings, check through their search engine history. If you’ve set a nighttime limit, don’t let them stay until the early morning chatting via MSN. If you ask them where they’ve been, ask them what web sites they’ve visited. If you’re concerned with who enters your house, concern yourself with who enters their computers. Obviously they can deceive you, like they do when they go out with their friends. Simply, be on alert in both cases and don’t let your guard down. That is probably the real problem. Children with Internet do not require attention, they don’t trouble you, they enable parents to relax while watching the television in the sitting room. It should be the other way round, parents should take the same precautions when their children lock themselves in their room with the computer and when they leave the house. Remember that the Internet is another door to the world. A door that provides access to practically unlimited information but, like all doors, it enables flows in both directions. In our homes, we put locks on doors to prevent other people from harming us, whether materially or physically. Perhaps on the Internet physical harm cannot be caused immediately, but other types of harm can be caused to young people. The good thing about being in a project like Tractis is that you can make decisions, no matter how stupid they may seem. One of the first technical decisions was to choose a development platform. After considering a number of alternatives, in the end we were left with two candidates: based on Java using Spring and Hibernate, and Ruby on Rails. We assessed the pros and cons of both platforms. I admit that at first I was more inclined to using Java, I suppose due to certain inertia after having worked with this platform in recent years. On the other hand, we had substantial advanced work in this direction, architecture design, including a prototype. However, Tractis is a company with very limited resources, we needed to develop fast with very few people, which is why we began considering Ruby on Rails. I had seen DHH screencasts and I was very impressed with the increase in productivity. I even followed a couple of tutorials on how to do a blog engine and other similar things. However, Rails lacked the fundamental characteristics of our business such as validation of digital signatures and certificates. We were afraid that what we gained in productivity we would lose out somewhere else. During those days, I remember that I would get up every day thinking about a platform different to the one I had thought of before going to sleep. In the end I did the only thing I could do, be a coward and let others make the decision for me. One of our collaborators, Ernesto Jiménez, was entusiastic with the idea of using Rails. Suddenly, an unexpected, though very important, decision variable entered the scene: the ability to attract talent to the project. Negonation wants to be a company with around ten employees and hundreds of collaborators. To attract the latter, we would have to offer them some fun, and Rails is definitely much funnier than Java. Paul Graham’s essays, particularly Beating the averages and The Python Paradox, were decisive in this aspect. The decision was made, Tractis would be developed on Ruby on Rails, using Webservices written in Java for the functions of validating certificates and signatures. Nearly four months have elapsed, and all I can say is that the right decision was made. Rails is an impressive development platform. It enables developers and designers to work with the same code. It has one of the most active developer communities at present and it helps us to have an easy-to-understand compact code. Lastly, it also has a very important advantage for a start-up: it makes us terribly dynamic, distinguishing us positively from other possible competitors. The bigger they are, the better for us. Do you remember those films in which, for example, a poor illiterate signed the sale of his mule with an “X” mark? I wonder if the individual actually knew the purpose of scrawling a signature on a piece of paper. A signature is simply proof of the signatory’s identity, the integrity of what he’s signed and the individual’s willingness to accept the contract’s content. Identity is based on the fact that only the signatory can scrawl a particular signature; integrity is achieved by preventing additional clauses below the signature and not allowing amendments or corrections in the document in question; finally, the individual’s willingness is based on the fact that he’s read the contract in question at the time of signing it. It seems clear that our poor illiterate was hardly able to ensure his identity, although he’s not in a worse position than the literates to judge by this experiment. Regarding the document’s integrity, nowadays there are all types of technology that can change it after the signature. Regarding willingness, our man could be signing the sale of his soul without knowing it (I recall that my credit card contracts seemed to say something similar in fine print). One could say that, by making two copies of the document signed by both parties, the issue of integrity would be settled, but this is not the case since, in principle, you don’t know which party has changed the content. In short, when guaranteeing our identity, the document’s integrity and our willingness to accept it, we are not much better than the illiterate muleteer. What can we do? I will personally start signing with an X from now on, to save on pens more than anything else. For anyone who thinks that the example of the illiterate guy is obsolete in developed countries, I recommend looking at the bottom part of this US form.